Whether you’re looking for a simple saree or a lehenga inspired by the likes of Sabyasachi, Varsidhi on Commercial Street carries some beautiful pieces you’ll want to check out! 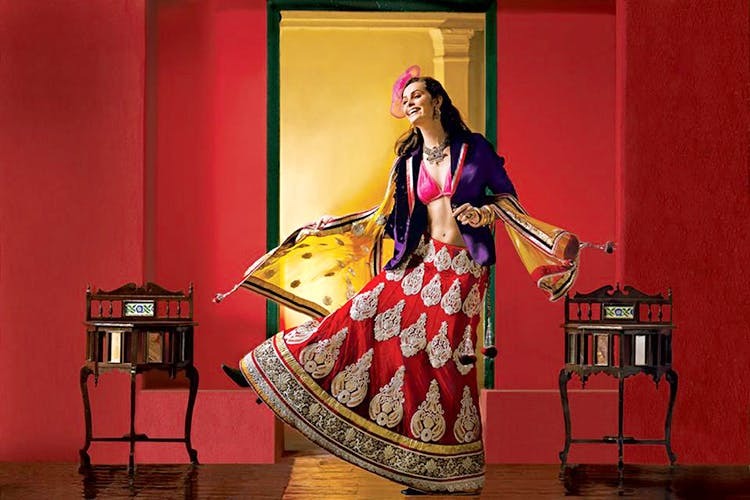 Salwars, lehengas, sarees, dresses — if you have a special occasion coming up, Varsidhi has two floors full of intricately designed ethnic wear across a range of budgets. And like all the fancy stores your mum and grandma go to do their saree shopping, you can expect the royal treatment here! Just wander in, find someone to assist you (they’ll probably find you first) and just sit back while they unfold yards of colourful cloths, beaded and embroidered to the nines! The sarees are downstairs, while you can find lehengas and anarkalis upstairs. Get ready to look like a star. No, really. They’re on trend when it comes to Bollywood fashion. If you’re the bride, then you’re certainly going to find plenty, for all your ceremonies. From lighter colours for the mehendi, the Indo-Western twist for the cocktail party or the all out Bollywood outfit, ideal at the sangeet. BFFs of the bride also will find stuff here. In fact, they’ve been divided into categories such as bride, bridesmaids’ and engagement party. If you’re looking for something a little more grand, ask to see their designer collection or as they call it, the Premium Collection. Fans of brands like Sabyasachi and Manish Malhotra will be excited to know you can find similar looking, jaw dropping lehengas that come at only half (or less) the price of the originals. That’s not to say they’re ripoffs, just that the beading and embroidery work are just as elaborate!